Today in Masonic History Aaron Venable Brown is born in 1795. Aaron Venable Brown was an American politician. Brown was born on August 14th, 1795 in Brunswick County, Virginia. He attended Westrayville Academy in North Carolina before going on to the University of North Carolina (UNC) at Chapel Hill. He graduated from UNC in 1814. After graduating from UNC, Brown moved to Nashville, Tennessee where he read law. In 1817 he was admitted to the bar. In 1818 he moved to Giles County, Tennessee, there he became a law partner of future United States President James K. Polk. 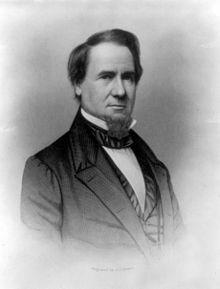 From 1821 to 1825, Brown served in the Tennessee state Senate. He had a third term in the Senate from 1827 to 1829. From 1831 to 1835 he served two terms in the Tennessee House of Representatives. In 1839, Brown was elected to the United States House of Representatives. He served three terms total, the first two was serving the 10th Congressional District of Tennessee and then in the third the Congressional districts were redrawn and he became the Representative from 6th Congressional District. After his third term, Brown had planned to retire from politics and resume his legal practice. Instead he accepted the Democratic nomination in 1845. Brown lost both East and West Tennessee, but won the more populated Middle Tennessee, which allowed him to win the general election by only 1,400 votes. Brown served only one term as Governor, he was defeated in his reelection bid. In 1850, Brown was a delegate to the Nashville Convention, a gathering of delegates from slave-holding states. They met to discuss what they would do if the Federal Government outlawed slavery. Brown called for the support of the Compromise of 1850. The Compromise had elements both Free states and slave-holding states did not like. Because of this the Convention voted down the acceptance of the Compromise. They also voted to put aside any discussion of secession. In 1857, President James Buchanan appointed Brown as the United States Postmaster General. He served in that position for two years. Brown passed away on March 8th, 1859 while still in the position of Postmaster General. Brown’s lodge membership is unclear. He was a member of Pulaski Chapter No. 7, Royal Arch Masons and he served as Grand Junior Warden of the Grand Lodge of Tennessee. There are also some indications that he was a member of Washington Centennial Lodge No. 14 in Washington D.C. The 1854 annual proceedings of the Grand Lodge of the District of Colombia indicate that Aaron V. Brown demitted from that lodge.